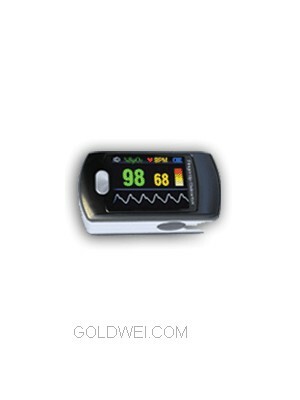 CMS 50E Fingertip Oximeter, Integrated with SPO2 probe and processing display module; Can be used in: hospital, home, community medical treatment, sports healthcare, etc. Can measure SPO2 and PR accurately; SPO2 and PR display, PR waveform and bargraph display. Can be used in: hospital, home, community medical treatment, sports healthcare, etc. Alarm function; can set upper and lower limits. USB interface to Computer, software can analyse, store and print the data. -> Can be used in: hospital, home, community medical treatment, sports healthcare, etc. -> Alarm function; can set upper and lower limits. -> USB interface to Computer, software can analyse, store and print the data. CMS 50F Fingertip Oximeter Model CMS50F, worn comfortably on the patients wrist for easy spot-check of blood oxygen saturation and pulse rate. It can be used for monitoring daily activities and overinght sleep studies; The compact design is intended to give the patient greater freedom while improving patient compliance.